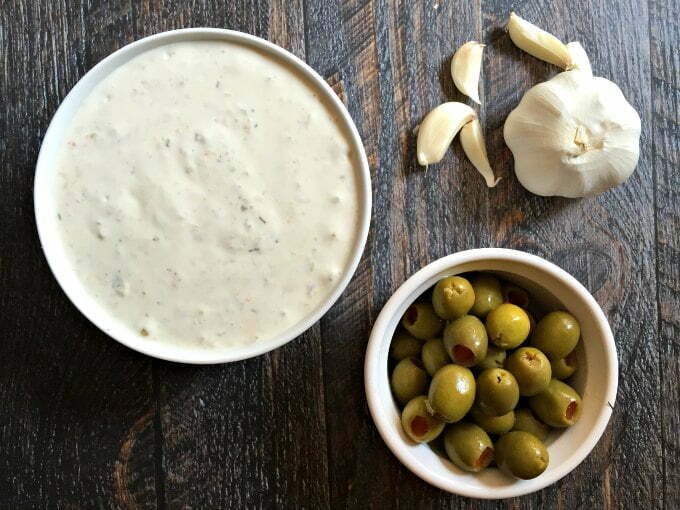 My mom’s green olive & garlic veggie dip is a welcome change from your everyday ranch vegetable dip. Garlic, green olives and spices give it a special taste and it’s low carb with only 0.6 net carbs per serving. Lately I’ve been on a veggie and dip kick for lunch. I can eat it quickly and for some odd reason I just really like it. However it’s hard to find good store bought dip. Some are ok but homemade is much better. I remembered a dip my mom made when I was young. It was creamy and garlicky and it had the distinct taste of olives in it. I didn’t even like green olives back then but I loved this dip. Lucky enough for me my sister Patti had the recipe and now I will share my mom’s green olive & garlic veggie dip with you. It’s a great change of pace from your usual ranch dip. And did I mention how easy it is to make? You add everything to your food processor and whiz. You’re done. That’s it. The secret ingredient is the green olives. I used the pimento stuffed ones like these and it was delicious. So in this yummy dip you have a nice clove of garlic, green olives, sour cream, mayo, dried minced onion, dried mustard, lemon juice, salt and a dash of hot sauce if you like. The original recipe called for cream cheese instead of sour cream so if you like your dips a bit thicker in consistency try that. I like mine a bit thinner so I don’t have to use as much. It’s really delicious and I hope you give it a try for your next get together or if you are like me and just want to munch on some veggies for lunch. 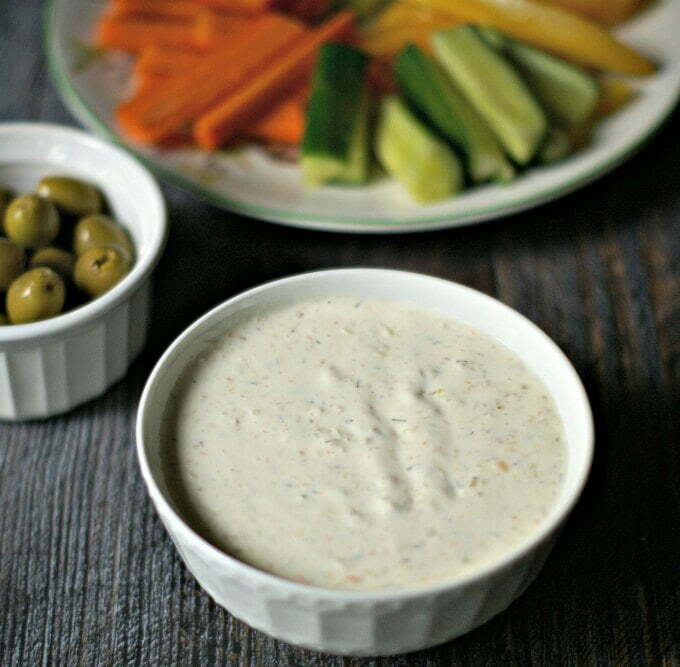 And if you want to try a delicious high protein vegetable dip, try this one. Enjoy! 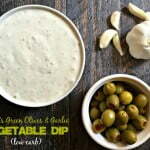 My mom's green olive & garlic dip veggie dip is a welcome change from your everyday ranch vegetable dip. Garlic, green olives and spices give it a special taste and it's low carb with only 0.6 net carbs per serving. Add all ingredients to your food processor or blender and blend until everything is creamy and well mixed. Let refrigerate for a few hours or even better over night. Serve with cut vegetables of your choice. Thank you Lisa. She would have loved you! 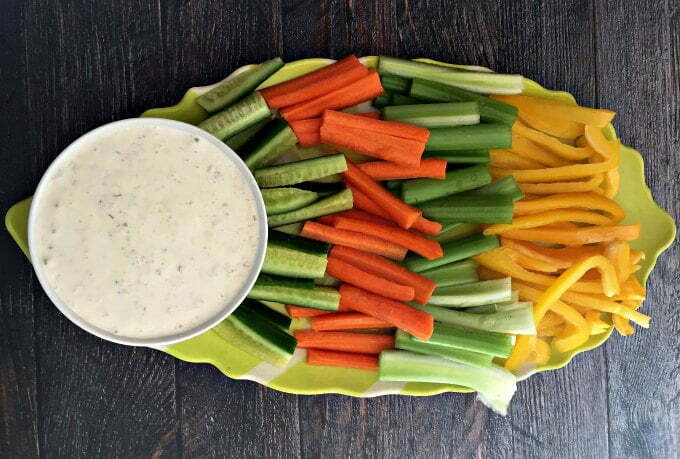 This is the kind of dip my hubby would claim all for himself and none of us would get any! He’s crazy about olives and they never last long in our house. I will have to make this for sure, he would love it! Thanks Ashlyn! I hope you and your hubby likes it! Sounds tasty and I love that it’s so easy. Thanks Caroline, it is easy and tasty too! when I make any dip, I use cottage cheese. Usually small curd low fat and a splash of milk. No one was the wiser until I made some green onion dip and everyone wanted the recipe. Most couldn’t believe they had eaten cottage cheese! The olives drew me in…can’t wait to try this! That’s a great idea Tracee! I made a dip awhile back with cottage cheese…loved the added protein. I’m definitely going to make this next time with cottage cheese as I eat this for lunch a lot and it will make it more a complete meal. Thanks for the tip! Small adjustments add up! I’ve been trying to rid my family of all processed food. Slowly but surely they are limping behind me toward the goal of only purchasing fresh fruits and veggies. Bread was a big deal! They love their white bread…so I kept sneaking in a little white whole wheat then to ALL whole wheat. That’s quite a task and one I’ve been slowly trying myself. I often fail but I keep trying. Bread is a big one for us too. Good luck and thanks for stopping by!